Welcome to My Life as a Foodie. This web site is designed as a portal for the podcast, which I produce, host, write, and . . . . well, do everything. If you’ve never listened to the show, here are a few things you should know. 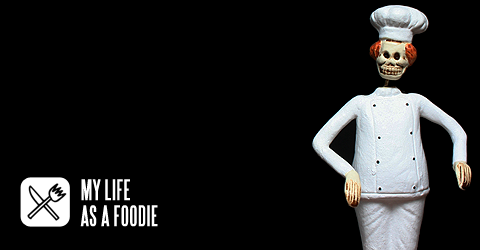 Q: How often is a new episode of My Life as a Foodie released? New episodes are produced twice a month. Sometimes more, sometimes less, but two a month is the norm. Q: What is the show about? Are there any recipes? My show concentrates on food, food issues, beer, television shows relating to food, and government issues pertaining to food. This is not a cooking show, but I do make something on the show from time to time and I’ll provide a recipe on occasion. If you’re really looking for a cooking show with recipes, watch Paula Deen. Yes, I said it. Q: How long do the shows normally run? The shows are generally 30-45 minutes in length, designed for drive time. I’ve been known to be long winded at times, going a full hour, but I try to keep it short for the most part. Q: Is it a family-friendly show? Can my kids listen? My show is generally geared toward men, so there’s a bit of profanity on it, and I refuse to watch my mouth. I’ve been known to drop the occasional F-bomb, S-bomb, and a few other choice “7 dirty words you can’t say on television.” My show carries the EXPLICIT tag on iTunes for this reason, even if the show does not have a single dirty word in it – just in case. If obscenities offend you, this is probably not the show for you. I do not edit my language, although guest producers have taken liberties in the past to do so. Q: Which shows on Food Network do you like? In reference to my answer to question #2, I don’t much care for Food Network. It’s a source of comedy for my show, and nothing else. I think it’s good for one thing, and that it’s a bridge for people who don’t cook at home to start doing so. For that reason, it’s useful. For my purposes exploring food culture, and learning classic techniques and ingredients, it’s useless. Top Chef on Bravo, Made in Spain with Jose Andres, No Reservations and Bizarre Foods on Travel Channel, just to name a few — those are shows worth watching. Q: Are you a chef, a home cook, or what? I’m not a professional chef, I’m a passionate home cook who’s still learning new things every day. So if you hear me get giddy over something I’ve just discovered that you may have already known about, roll with me. It’s one of the greatest things about the hobby of cooking, learning new things. Q: Can I contact you directly? Q: Where are the beer reviews? Hell yes, I’m on iTunes. You can subscribe to the show and have new episodes automatically downloaded to your iPod by clicking this link. Thank you for your interest in My Life as a Foodie, for your participation on the web site, and most of all – for listening.